So we’re getting ready to harvest the honey, which means that last week I went up to the hive one morning before work and reversed the supers, putting the bottom one on top. Then I took the inner cover and insert a bee escape. A picture of of this process is here, which also has some good tips on removing honey supers and extracting honey. The bees are doing well, starting to wind down on bee production, although they both still have lots of brood. I’m thinking it may be time to start feeding South again, although they seem to still be bringing in some honey. 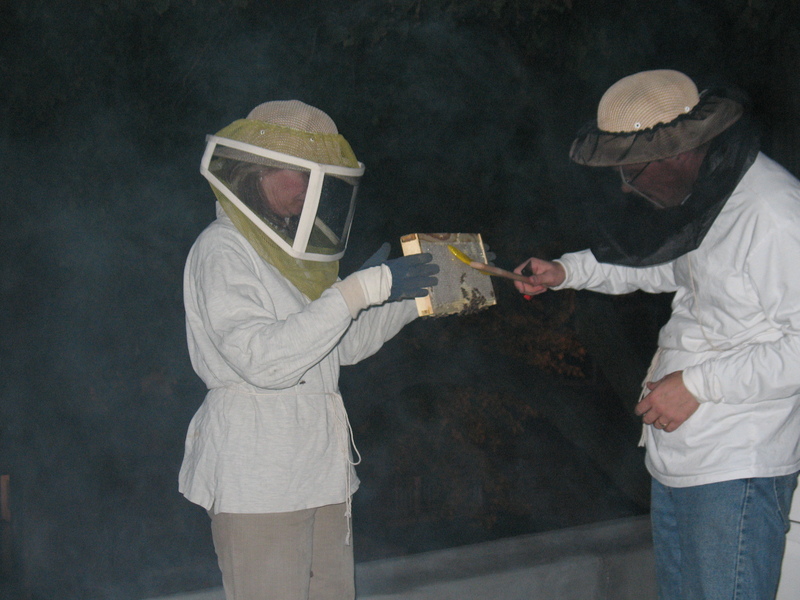 Will consult with my more experienced beekeeping friends. The big news is that we will be featured in a column by my friend John Kass in Thursday’s Tribune. John’s father kept bees, and so it was a pleasant surprise for him when we first started working together that I had kept bees for a long time myself. John, his new Legman, a videographer and photographer came by early this morning. I put the bee escape under the second super, although I’m having second thoughts about that…might take it off and let the bees cure it a little more. But it was fun. John brought some yoghurt his mom made, and we ate fresh honey with the yoghurt and some walnuts. Lots of fun. And a fun video: chicagotribune.com/beekeeper. More soon. I’m also adding photos to some old posts, so stroll through and see some more of our visits & visitors. Not much time to say much, but things are going well. We haven’t seen the queen in either hive, but the queens in both are laying well. Checked them today on my own, a very Zen feeling, just me and the bees. North’s got one full, almost entirely capped super, and is almost done filling the second. South has probably the equivalent of six frames of brood and eggs, and North still has about 12, although the queen there appear to be transitioning to a smaller number of active brood frames. Last Sunday, my brother Greg and his wife Aimee visited the bees with me. One photo Aimee took is here. I’ll add another later in the week.